I popped in to read what Fern has been up to on one of my newly found favourite blogs - Life on the Balcony. In a post called How to move with your plants, Fern had highlighted some wise advice from Julie Bawden Davis. Some good tips, especially the first one, which advises the plant owner to let the plant pot dry out a little before moving to a new home and only watering on arrival. Another good piece of solid advice is to transport your plants in a covered vehicle which leads me on to landscape plants destined for planting in a garden. How many times have you seen a car or open back truck go by with a tree or shrubs, in full leaf, being blown horizontal as it tries to resist the wind at thirty miles an hour. How many of those gardeners (and that includes careless professional gardeners too) return the tree or shrub a few weeks later because it has died or lost most of its leaves? It is fine to transport a tree or shrub in the winter when it is in a dormant state but when it is growing then either get the garden centre to deliver, hire a van or at the very least wrap the branches and leaves in hession or fleece to protect it. During a normal day, a tree will breath through tiny mouths on the leaf surface called stomata. The Stomata (Greek for mouth) will take in carbon dioxide and as a by-product, release oxygen and water - a process known as Transpiration. Increased wind flow can speed up the rate in which the plant loses water and forced drying through lack of protection can damage the leaf surface permanently by burning the cuticle. Some shrubs will recover and new leaves can grow back but, depending on the severity of the poor treatment it has received during transportation, damage to the plant structure can be irreversible. Tying in the branches (as illustrated in the photo) will also help and if the whole of the leaf structure is covered then the plant will be protected until re-planted. Wrapping of the plants also means easier handling and much greater space efficiency when loading. 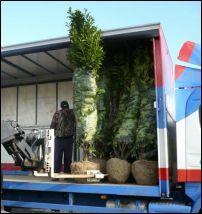 The picture shows Prunus laurocerasus being loaded at the Plants to Go depot in Woking.